A view of Millbank, a quiet Thamesside road running from the city of Westminster to Chelsea. The name Millbank is derived from Westminster Abbey's old mill which was located on marshy ground at the end of the present day Great College Street. 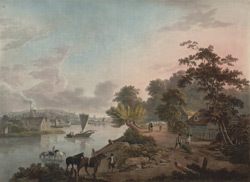 The area remained undeveloped until the village of Pimlico began its growth in the 1820s.